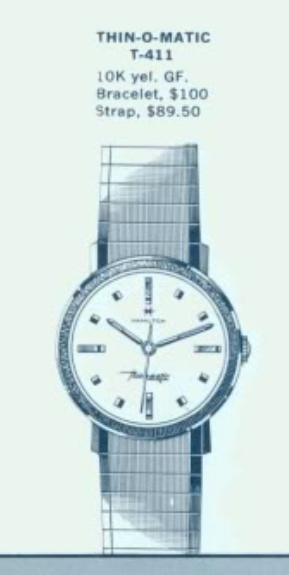 I think my least favorite line of watches is the Thin-o-matics. That's not because they are bad watches. It's just that their movements can sometimes be very finicky, especially when you get into the 1970's when the movement used as offset center wheel. When you add in calendar complications, etc. they can really be a time consuming challenge to tackle. However, some Thin-o-matics used ETA movements and I don't mind them at all. In fact, they're not that much different than the ETA movements used the Accumatic line - just a little thinner overall. I recently came upon a Thin-o-matic that was in desperate need of some attention. It's a 1964 Thin-o-matic T-411 and it was made for two years. The T-411 came in a 10K gold filled case. You could get it on a strap or on a bracelet for a little more money. $100 doesn't seem like a lot of money today for a quality time piece but $100 in 1964 was the equivalent of almost $900 today. Interestingly, that's about in the range of what new Hamilton automatics will run you... give or take a little. My project watch must have seen a lot of action, as it bears the scars of a lot of use. Notice how the relatively slender lugs splay outward a bit. Maybe a strap that was to wide was jammed in between them. I was happy to see that the case back is pie-panned shaped. That's a sure sign that there's an ETA movement inside and not a Buren micro-rotor. Again, micro-rotors aren't bad movements, they're just a lot more complicated to work on. The watch opens through the crystal and once the crystal is out of the way, it reveals a yellow reflector ring sitting on top of the dial. Once I lift that off I will be able to see the joint in the two-piece stem and remove the movement. The dial is pockmarked with dots that look like grains of sand adhered to the finish. I don't think it's sand, it just looks like that. I suspect it's just the result of moisture effecting the finish on the dial. I'll have to be very careful handling the dial so that I don't lose the printing when I try to clean it up. The movement is nice and shiny but also shows lots of fine dust or corrosion - it's hard to say what it is. Everything gets taken apart and thoroughly cleaned and dried. A micro-rotor would have almost twice this many parts. The movement, without the rotor assembly, is now back to running condition. The timer has something going on but it's hard to tell what. The amplitude of 357 degrees is a bit high. That would indicate the balance is almost making a full circle when it turns. That's a bit much and would result in the balance impulse pin hitting the pallet fork from the wrong side. I carefully reclined the hairspring and pulled a stray filament of fiber off the spring. Now the performance on the timer is looking much better. The two lines are running smoothly. The amplitude of 229 degrees isn't a concern, as the stem doesn't have a crown so I haven't wound the movement up fully yet. The beat error of 0.6ms would be more than acceptable on most watches but since it's so easy to adjust on ETA grades, I would feel guilty not trying to improve it even more. I have to guess which direction to move the hairspring stud but eventually I dial it in even further. With the beat error reduced to 0.3ms, I can tweak the regulator index and slow the watch down to almost perfect time keeping. A new 28.1mm PHD crystal should do nicely and make a big improvement to the looks of this watch. I didn't lose any of the printing on the dial but I didn't get it perfectly cleaned either. Most people I know who were born in 1964 have a few spots so there's nothing wrong with a 1964 watch having a couple either. I was able to gently coax the lugs back into proper shape and installed a fresh lizard strap. Now that the watch is cleaned you can actually see that the bezel has a florentine engraving around the perimeter. You can see that detail in the catalog image but the grime originally on the watch masked that detail. A word from the unwise. I have been of a vintage Hamilton kick for a few months now. Instead of just buying a nice one from Dan that I know has been serviced and ready to go I have picked up four at auction. Well every one of them has had some small issue. Whether it be a Franken watch or loose movement or no way of knowing when it was serviced. So even if it arrived running it may just be grinding itself to a halt. So if you are looking for a nice vintage watch be sure that you buy it from someone who knows what they are doing and you know it has been serviced and ready to use. As I now have four watches that need service at best, some repair or Franken that I cannot sell. Or sell the whole lot at a loss. When I could have just bought that one nice one that I know was good.